AC Milan captain Alessio Romagnoli is motivated to deliver a derby victory for heavily scrutinised head coach Gennaro Gattuso in Sunday's crunch clash with rivals Inter. 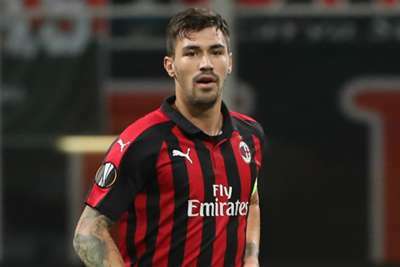 Italy international Romagnoli has started six of seven Serie A matches since inheriting the armband from Leonardo Bonucci, who rejoined Juventus following an ill-fated season at San Siro. Though yet to keep a domestic clean sheet this term, the Rossoneri have found winning form after a run of three successive league draws that prompted speculation over Gattuso's future. Romagnoli was notably at fault for a costly late error at Empoli amid that sequence and the 23-year-old is now determined to repay his boss' support. "We are very close to him," the centre-back told Milan TV as his side target a fourth straight win in all competitions. "He gave us a lot last season when he arrived and so we will do all we can to make him proud. "Our coach knows our strengths and always tries to get the best out of us because we should never be content." No player has made more clearances than Alessio Romagnoli (27) and Stefan de Vrij (23) for their respective sides in Serie A this season. The two Milan clubs are separated by four points leading into the San Siro encounter, although Inter have played an additional match. Both have designs on a top-four finish and Romagnoli is fully aware of the importance of three points. "These are matches that require a good amount of personality," he said. "It's a fascinating derby both for our tradition, for the stadium, the fans, for many other aspects. "We're aware this game can give us an added morale boost, however, other than being a derby, they are our rivals in the race for a Champions League spot. "We have to start getting used to staying as high as possible in the table."